Bring all the luxuries from home you'll have a place to store them safely out of the elements without taking up precious tent space in a Coleman Tenaya Lake Fast Pitch 8-Person Cabin with Closet. A built-in closet with shelves and a hanger bar makes it easy to keep your clothes and gear organized, so you can skip digging though a pack for what you need. 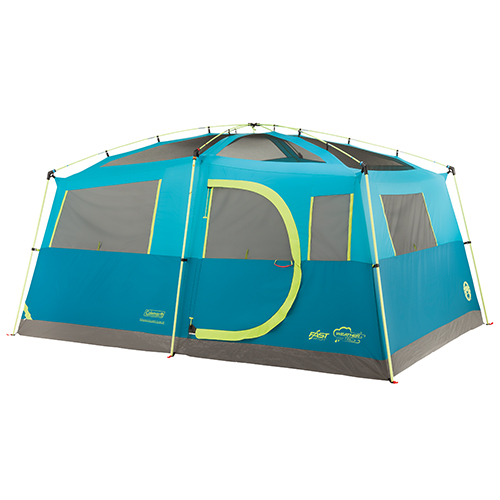 The Fast Pitch system uses pre-attached, color-coded top poles and hub, fast fit feet and snag-free Insta-Clip suspension to let you set up your tent 55% faster than a comparable Coleman tent with conventional setup. If it rains, the included rainfly and the WeatherTec system with its patented welded floors and inverted seams will help you stay dry. Illumiline reflective guy lines are more visible at night so you don't get tripped up if you need to take a walk in the dark. A room divider provides extra privacy for your entire group as they relax in a space large enough for up to two queen airbeds. When it's time to head home, the tent fits into an included wheeled carry bag for easy storage and transport.